Everyone had a role at our busy exhibition. 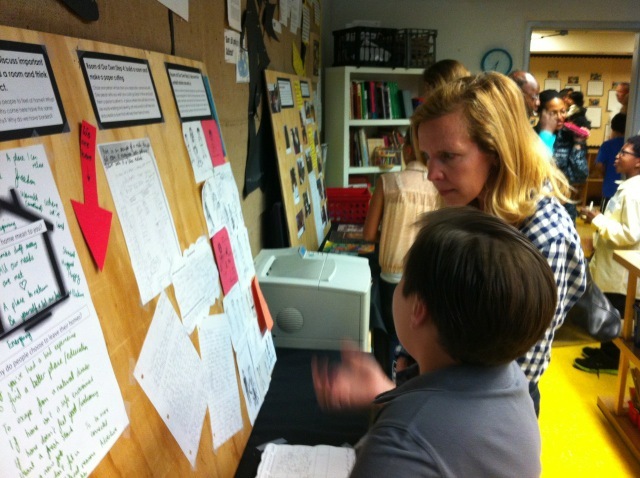 On June 5th 2013, Explorer Elementary held our annual school wide Exhibition. It was on this evening that we exhibited our work from the Room of Their Own Project. We started this project in March and over the weeks we learned about the lives of people who had come to California from the Gold Rush onwards. We read books, researched online and, most importantly, interviewed people who had immigrated to here. We then selected 8 people who we wanted to learn more about. Some of these people were ones that we had read about in books and some of these were people who we had interviewed. Some people explained the process. We worked in groups to build rooms for these people. The rooms contained furniture that we had built using wood working, a listening station where you could hear us reading letters to the person who we made the rooms for and paper cuttings showing their immigration journeys. Read on to find out more about each of these aspects of our project. You can also check out the Maker Blog that our class was featured in! Others taught visitors how to wood work and paper cut. We shared our work with Bhavna Mehta, the paper cutting artist who had helped us get started. We made paper cuttings to show the immigration journeys of the people we had chosen. Although these were individual paper cuttings, they also had to work with the other paper cuttings that were being created by people in each group. The artist Bhavna Mehta came in to work with us on our paper cuttings. She taught us that the frame of the paper cutting doesn't have to be a rectangle, it can tell a story too. The groups that were making paper cuttings for Veronica and Esperanza's journeys were especially inspired by this. Look carefully at the pictures below and you will see that the paper cuttings representing Esperanza's immigration journey are all roses and Veronica's immigration journey is told by a woman and two suitcases. Do you want to know why? Well, you'll have to read their artist statements. Scroll down the page to find the whole group and the individual artist statements. Check out our paper cuttings in the slideshow below. You can also read our group and individual artist statements too. Look at us in our finished rooms here (beware, this was the day after exhibition so some of us are feeling silly).